A comical spin-off of epic proportions. 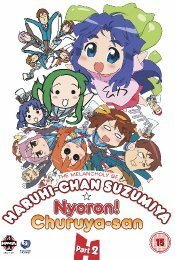 In these animated short episodes, based on the comical spin-off manga, the characters are presented in cute little versions of themselves and focus each of their unique quirks. Haruhi is even more outrageous with her twisted understanding of Valentine's Day and Halloween, Mikuru is just as clueless as ever and Yuki is an ero-game addict. There comical shorts were originally a fan drawn 4-panel parody manga and due to its underground success, chosen to be animated. Follow the whimsical adventures of Churuya-san (based on the character, Tsuruya-san) on her quest for her favourite food, smoked cheese.